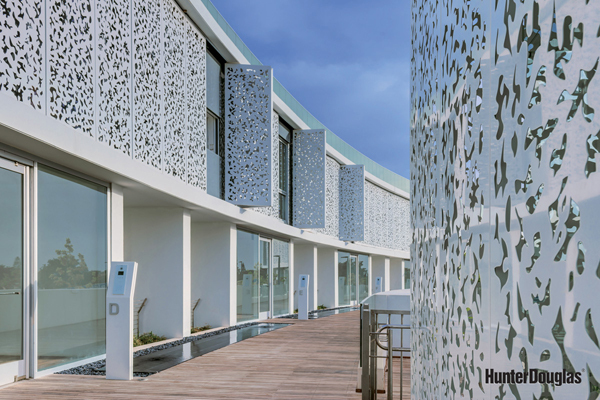 Motorised folding shutters manufactured by Hunter Douglas have provided a series of deluxe private villas overlooking the Mediterranean Sea in Israel with a stunning visual effect as well as a practical solution to reducing solar glare. Designed by celebrated Israeli architect Ilan Pivko, the cliff top villas in Harsuf, near Tel Aviv, are modern and sleek with clean lines that give the building an ultra-modern look. The first floors of the villas on the south-eastern side are complemented by motorised folding shutters that have an architect-designed pattern in the perforations that give the illusion of falling leaves. The challenge for Hunter Douglas, the international leader in architectural building products, was to create a curved façade of motorised folding shutters that closed closing at 180 degrees and concealed the runners to ensure that a clean, flat uniform surface is created when the shutters are closed. Built aluminium frames and covered with aluminium sheets, the shutters, which are operated by a central control system, were painted white, thus offering optimal control of heat and light. 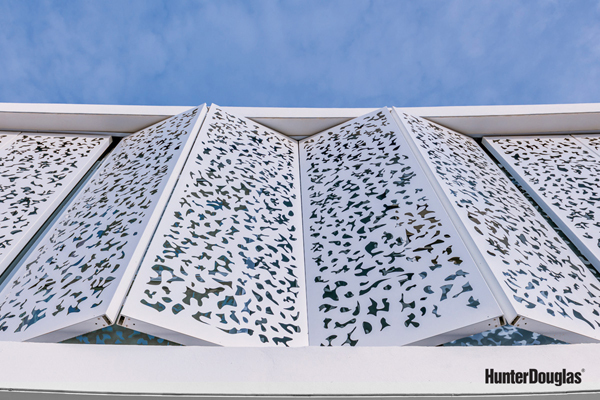 For this complex, the architect designed 12 different perforation patterns to create non-uniformity among the panels on the villas. The full height of a lobby building at the centre of the building project is also covered with aluminium sheets with an identical finish identical to the villa shutters. 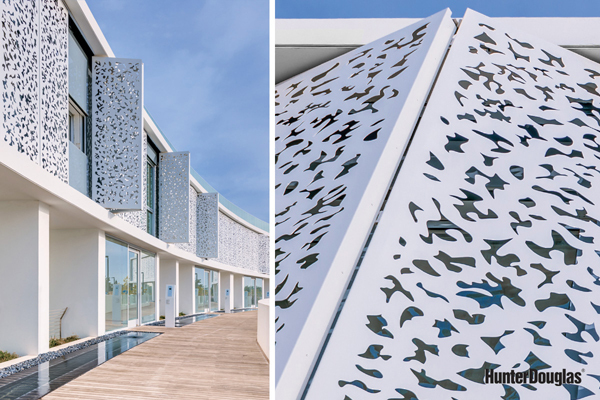 The result is an elegant white façade that blends in with the decorative pools on the one side of the project and the Mediterranean Sea on the other. 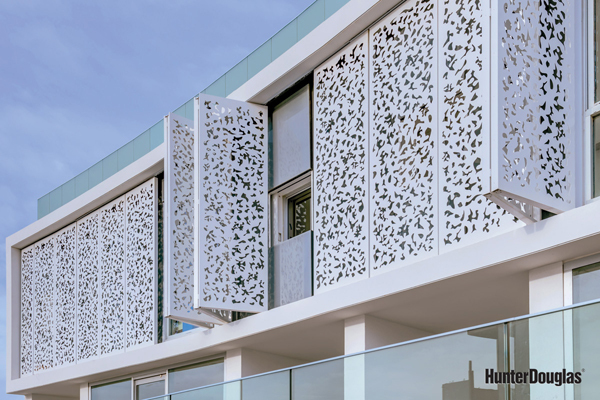 Salko Kapetanovic, of Hunter Douglas, said the beauty of its folding shutters was that they not only provided excellent sun control – reducing solar radiation impact by 90% – they can also be perforated in any pattern to suit the design of the building on to which they are being fixed. They can also be opened and closed manually as well as by a motorised operation. “The perforations filter the sunlight, so you can still see outside when the shutters are closed, but it also helps to reduce the heat coming into the room,” he said. Hunter Douglas Folding Shutters are typically built in aluminium and have either fixed louvre fins or a perforated aluminium sheet panel. However, they can be provided with any custom material, which enables a complete integration in the surrounding façade. Shutters come in widths from 530-590mm and heights up to 3600mm. The aluminium components can be anodised or powder coated, but as a standard the components are anodised technically blank to meet the European code EN-12373. Different colours and thicknesses are available. The aluminium profiles can be coated with polyester powder, which has an average layer thickness of 60 micron and a gloss of 70%, while powder coating is applied according to the Qualicoat standard. Hunter Douglas offers its folding shutters in three colour ranges: standard RAL colours, metallic RAL colours and pearl RAL colours, although other standards such as NCS and Pantone are possible. Profiles can be coated with the Softcoat Systems, which provides a soft structure look with high scratch resistance and a smooth gloss of 4%.